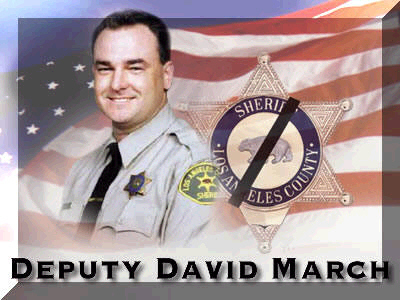 I was inspired to write this letter after some personal email communications with Teri March regarding her late husband, Deputy Sheriff David March, whose life was taken in the line of duty by illegal alien criminal Armando "Chato" Garcia who ran to Mexico to escape justice. In your letter of April 26, 2002 to me, you said that you were in favor of California Senator Gil Cedillo's bill to grant driver's licenses to illegal immigrants with the proviso that the licenses be "...heavily-conditioned..." requiring among other things, background investigations by the FBI and the U.S. Department of Justice to ensure that applicants do not have criminal records. But in spite of your "conditional" approval, Governor Davis rightfully vetoed that bill. Undeterred by your advice that driver's licenses for illegal aliens be conditional, Cedillo has defiantly authored his latest (third) bill (SB 60) which has no safeguard conditions at all. Last year's measure would have applied only to people in the process of obtaining legal status. The new version applies to all illegal immigrants. The companion measure to last year's bill which required that applicants without Social Security numbers submit to a criminal background check, is absent from this year's measure. When I wrote to you last year, I told you about my Mexican immigrant wife's brother residing illegally in the U.S. Since then, two more of her brothers have illegally entered the U.S. Two of them left California for other states because, among other amenities, those states issue driver's licenses to illegal immigrants. What is significant, is that my wife, who is a naturalized U.S. citizen, had already petitioned for two of my brothers-in-law so that they could legally immigrate. But they decided to come illegally anyway. Why not? Illegal immigrants have learned that they can virtually change the law by breaking the law -- and that is the rationale of Assembly Member Cedillo who says: "they're going to drive without a license anyway, so let's give them one," ostensibly so they can buy auto insurance. But most reasonable persons believe that the insurance issue is Cedillo's attempt to cover up his real agenda -- that of open borders at any cost, even if it will allow criminal aliens to obtain valid drivers licenses. All of my brothers-in-law fall into the category of honest, hard working, immigrants looking for a better life for themselves and their families -- and I can personally vouch for the fact that they are not security risks. And I also recognize that the majority of illegal immigrants are not security risks. But how can law enforcement determine who are the "good" illegal immigrants and who are the "bad" illegal immigrants. Your own study in 2000 revealed that an estimated 38,748 county inmates -- 23% of the county jail population -- were undocumented immigrants. The report said further that the county's annual cost of dealing with "deportable criminal aliens" was estimated at $150 million. The issuance of California driver's licenses to illegal immigrants will surely exacerbate the crisis in your jail. As much as I would like my brothers-in-law to get driver's licenses, I would not want the security of Los Angeles County (and California) compromised. Consider also, that in 1994, under pressure from city, county, and state attorneys on behalf of single mothers and battered women, California made it a requirement that driver's license applicants submit valid social security numbers for the purpose of making it easier to track deadbeat dads. Cedillo's bill if passed, would undermine this effort. Moreover, the bill is a magnet to attract foreign aliens, some of whom are already deadbeat dads in their own country who wish to shirk their family responsibilities by being provided with a new identity, compliments of California. It is laughable to assume that once issued a license, that the majority of illegal immigrants will run out to buy insurance. Without any adverse consequences for driving without insurance, what would be the motivation to go out and buy it. You said yourself that "There are thousands of undocumented immigrants that are currently driving without a license..." If you can't enforce the law against driving without a license, what makes you think that you can enforce the law that licensed drivers have insurance? While the passage of SB 60 might slightly increase the number illegal immigrants who will be trained to drive and be insured, the bill will unquestionably create an incentive for even more illegal immigrants from other U.S. States, Mexico, and other countries, to flood California, thus creating more law enforcement problems than the bill will solve. While the insurance companies favor Cedillo's bill because a some "good" illegal immigrants would be added to their customer base, they are opposed to cooperating with the DMV in putting together a joint database that would keep track of registered vehicles that are not insured. I recognize that much of the problem of enforcing the law in areas of high illegal immigrant density has been dumped on you by BICE (Bureau of Immigration and Customs Enforcement -- formerly INS) as a result of years of their NOT enforcing immigration law, and too often forcing local law enforcement to allow illegal immigrant suspects to "walk" because it is just too much trouble to deal with those who do not have IDs. Over and over, I hear law enforcement leaders like yourself say that it is a waste of time to turn over illegal alien law breakers to the BICE because they will just come back anyway (as did Armando Garcia). But just because the BICE doesn't do their job, doesn't mean that the LASD shouldn't do theirs. Illegal alien criminals return to L.A. County because they perceive that law enforcement doesn't care. And awarding a driver's license to those who snub their nose at the BICE supports their perception. In an open letter of April 21, 2003, by Teri March, she said, "The bad guys have found the broken link to our justice system. More lives will be lost if nothing is done." If Governor Davis, who once referred to California and Mexico "...as one magnificent region...," signs SB 60 into law, it will be a slap in the face to Teri March and dozens of other victims whose killers have taken refuge from justice in Mexico. Not only will Governor Davis virtually invite more Mexican "bad guys" who will be eligible to receive valid California driver's licenses, but he will send the message to the Mexican government that they hold the trump card in any effort to change U.S./Mexico extradition policy. I do not doubt that you are aligned with the Sheriffs of Riverside and San Bernardino Counties in opposing SB 60, but I believe that simple passive opposition is not enough. In the name of David March, by way of this letter, I am appealing to you and other law enforcement leaders, to actively and publicly lobby Governor Davis to veto this terrible bill. Teri March, Assemblyman Cedillo, Governor Davis, County Supervisors, District Attorney Steve Cooley, LASD Sgt. James Fosdyck, Whittier police Sgt. Wyatt Powell, California Insurance Commissioner John Garamendi, Jerry Davies, at the Personal Insurance Federation of California, and Other unnamed recipients.